Router Boss allows modern woodworkers to create the same traditional joinery in their creations as master craftsmen from centuries past, but more quickly and easily using a power router instead of specialized hand tools. While power tools can remove the drudgery of routine tasks and provide the ability to carry out work that would otherwise require a lot of hand tool skills, you really need a tool that meets all your requirements and doesnt limit your creativity. By providing a flexible management system for both the router and wood, Router Boss gives you the seamless control you need without limiting what you can do. Router Boss excels where typical router jigs fall flat, by making all different kinds of joinery including mortises, tenons, dovetails, and more. Available in three different models, Router Boss works with a sliding bar that secures the wood and prevents it from coming out of your grasp. Like a 3-axis milling machine, variance in cutting direction and different angles is the key to Router Boss versatility. You maintain full visibility while making your cuts, which reduces mistakes and resources wasted. An optional plunge-assist bar provides quick direct control over your cut depth when using a plunge router. Simply put, Router Boss is a multi-functional milling tool that will reduce the number of tools you require, save space in your shop, and increase production and quality of work. Router Boss by itself is capable of a vast array of woodworking tasks, and its custom add-on accessories takes its versatility to the next level. The accessories add work-holding capabilities and help you to employ repetitive positioning when working on multiple pieces. Router Boss is even capable of functioning as a router table, allowing for decorative profiles and grooves. To obtain all that Router Boss does, youd need to purchase multiple other tools that could have you moving all over your shop with independent setups on each. A major benefit of Router Boss is its ability to show the cut you are making, while you are making it. You can cut to a scribed line as with hand tools, but with machine control. Router Boss also works with scales and cursors, story sticks, and even your computer-made templates. Stops in the T-tracks and base plate help you effortlessly position the cuts you desire, and built-in laser crosshairs and LED lights illuminate the work and show the exact center of your cut. Optional digital scales complete with LCD displays will guide your Router Boss in the most precise cuts attainable on any machine. Simply put, Router Boss means freedom. Unlike typical jigs, you dont have to follow templates or adhere to limiting measurements to make the joint you desire. Router Boss joint variations and precise cuts give you more control than any router jig on the market. Even its installation gives you a choice: wall mounted or bench. Front and rear dust collection with shop vac hose connections keeps your shop air clean and minimizes mess. A fully illustrated manual with setup instructions and examples of popular joints is included with every purchase. To create beautiful traditional joinery, you only need a Router Boss, plunge router, and the right bits. You can use any router and bits, but we readily recommend router bits with longer � shanks to use with Router Boss, such as our Craftsman Gallery bits. A DeWalt 625 router is a great choice to work with Router Boss. Our Quick Change Chucks will make bit changes quick and efficient. To get the full picture on Router Boss accessories and their applications, click on the Accessories tab on our products menu and review them. 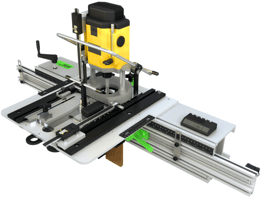 We encourage you to pick up the phone and give us a call or click on the Contact Us link and email us with any questions as it relates to Router Boss and its superior performance as compared to other routing jigs and single-purpose joinery machines. Router Boss isnt just another tool for your collection. Its an investment in your overall woodworking productivity. At The Craftsman Gallery, nothing is more important to us than your success with Router Boss and its related accessories. We provide full support after the sale for your peace of mind and to enhance your return on investment. We offer a one year warranty on all parts, and a hassle-free refund policy in the rare event you need to return your Router Boss or any of its accessories. To select your Router Boss model click on the model name for details. Consider space requirements. Making your woodworking easier, fun and more rewarding is within reach. Order a Router Boss today and put it to work in your shop. As a Router Boss owner, I can say that the website materials and videos dont show how much FUN the Router Boss is to use! Once you get your hands on the Router Boss, youll find yourself using it anytime you have a choice between the Router Boss and another tool simply because the Router Boss is so more enjoyable to use. Some people think the Router Boss is complicated, but Im not sure why. The Router Boss allows you to smoothly move and cut in 3 axes without feeling like you need 5 hands! Woodworking doesnt get any simpler than that. Many hobbyist woodworkers that are only making a single unit, HATE making jigs. When I am reading my woodworking magazines, I used to skip beautiful projects that require complicated jigs that looked like they would take as much time to make as the furniture itself. With Router Boss, frequently, I can do the exact same thing as the jig with a minimal effort. Thus, the Router Boss has opened projects to me that I previously avoided just because I refused to make the jig. Still have questions? Click on the Contact Us link and send us an email. We are happy to answer questions and provide assistance.